A proper fusion job site involves having the confidence that all fusion joint data is recorded with the utmost of accuracy. Proper joint data allows the tranquility of knowing that the joint fusion was performed utilizing current standards along with the correct pressure and times. Before tablets made data recording so much easier, joint fusion data required manual recording which is cumbersome and does little favors in boosting productivity. 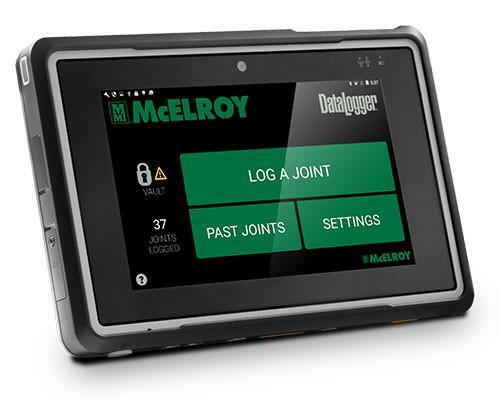 With the McElroy Datalogger® 6, all of this information is available at the touch of a button in one portable solution and can always be kept current with little hassle. The DataLogger uses Google’s popular mobile operating system Android to record parameters of the fusion process, including vital information like heat soak times and heating pressure. Despite being a tablet, the DataLogger is designed for conditions where the environment is rugged. If conditions are wet, the tablet can receive moisture thanks to its IP67. Some of its additional features include two cameras to snap current conditions, a barcode scanner for simple fitting and pipe information data entry, and a wireless sync feature to simplify sharing fusion joint records. Check out the DataLogger 6 on the MIMECO website for more information. If you would like to purchase the tablet, please visit the McElroy DataLogger 6 page on the McElroy Parts website.